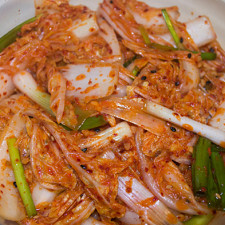 Dwaeji Bulgogi (돼지 – Pig/Pork, 불고기 – Fire Meat) is something I grew up eating at home. My mom would make this for my dad quite often! For the period of time that I was vegetarian, I didn’t eat this; the bulgogi disappeared from view until after I started eating meat again, and after I had moved back in with my parents (after college). 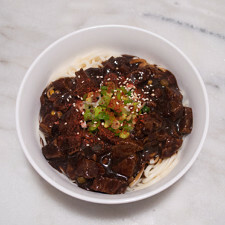 I pretty much had forgotten about dwaeji bulgogi, and I can’t believe that I did! It’s so good with a piping hot bowl of rice! My mom has her way of making this dish, so I tried recreating it. I have to say, it definitely turned out tasty! There was some left over, so I saved the rest of the dwaeji bulgogi and we had it for dinner again the following day. It tasted even better the second day. And I think Kitty enjoyed eating it too! Place the sliced pork into a large bowl and set aside. In a small bowl, bring together the hot pepper paste, warm water, and maltose, mixing until fully combined. Add the scallions, ginger, garlic, sesame oil, soy sauce, and sesame seeds, and mix thoroughly. Pour the seasoning over the pork and massage the sauce into the meat. Cover with plastic wrap and refrigerate for 2 hours, or overnight. Cook the meat over a grill or gridiron, turning the meat occasionally. 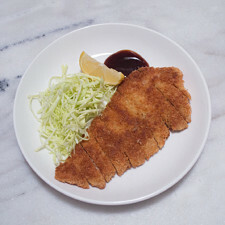 You can also pan-fry the pork on medium flame until fully cooked, about 8-10 minutes. Serve with side dishes and a bowl of rice. The neck portion of the pig is what is often used for this recipe. I mix the seasoning together first, making sure there aren't any lumps of paste and every ingredient is incorporated well. 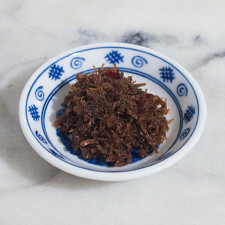 If you are worried that the sauce may be salty (because each brand of hot pepper paste has slightly different amounts of salt), sample the seasoning before adding the soy sauce. Add less than the given amount if the seasoning seems too salty, and add the rest after cooking (and sampling a piece of pork), as necessary. Substitute a small sweet onion to the sauce mixture (equivalent amount to scallions), or add half of the scallions and half a small sweet onion if you want a more varied flavor. Slice the onion thinly, or grind the onion, and add to the mix. If there is too much pork to cook at once, cook the amount in batches. Conversely, cook half and store the other half in the refrigerator for another meal. I cooked this batch in a pan versus over a charcoal grill. It's great either way! If you are in a hurry, season the meat, rest it in the refrigerator for an hour, and then cook. Be warned that the flavors may not be fully melded together. It helps if the whole mixture has had some time to sit, and flavors have been allowed to come together. Savor this dish by eating it as a wrap with perilla leaves and banchan (side dishes). 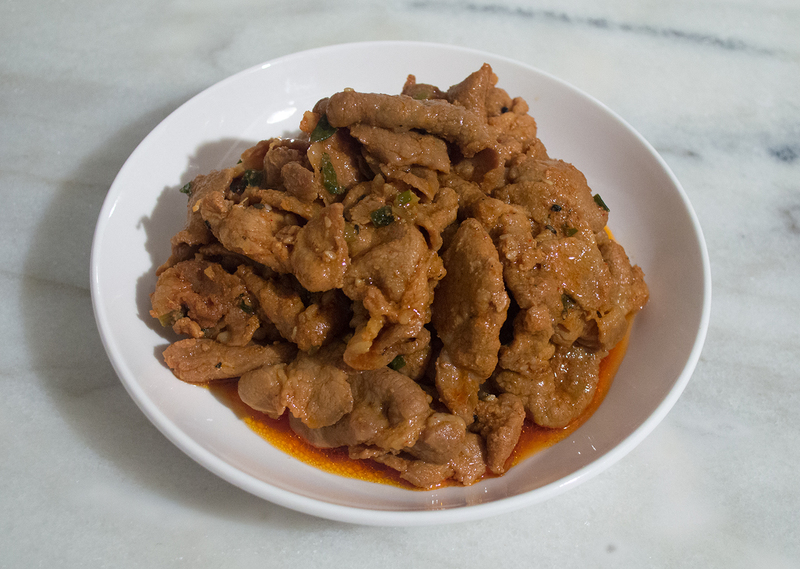 Made our Recipe for Dwaeji Bulgogi (돼지 불고기) - Spicy Grilled Pork? 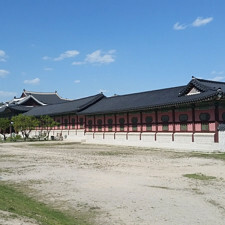 No thoughts on "Dwaeji Bulgogi (돼지 불고기) – Spicy Grilled Pork Recipe."